The South does attract people, indeed. It has particularly attracted dwellers of the North. The simple life, being close to Nature, since Nature is much more gracious there, greater openness and spontaneity of people, lighter cuisine, better coffee, and wine too. And, there’s a also beauty to it – usually, simple beauty of a landscape, the latter’s painting-related usefulness, which has passed the test of several past ages, proving reliably operational since ages ago. The gentle hills, with castles on their tops; meandering roads climbing up the peaks, and the green spindles of cypresses sharply piercing the sky’s blue. We’ve known that for a long time now, and very well so, indeed. Yet, can one ever get fed up? Emptiness, silence, peace and quiet are also predominant in Katarzyna Jędrysik-Castellini’s paintings. Whether this is a casual relation, or a kinship out of choice, is rather hard to decide. I do have, however, an irresistible impression that the ambience of that particular interior made the then young painter highly impressed. When we look at her picture painted in 2002 titled A white pitcher against white background, then it becomes easy for us to figure out that she could have seen it right there, at the ‘Casa Cima’. Or even if this is not true, then this fact is of no importance at all, since it perfectly goes hand in hand with that ambience of the venue, as summarised in the three words: emptiness, silence, peace-and-quiet. Exactly the same thing happens in two other of her ‘pieces for White and Grey’, that is, Il chiostro (2002) and A silhouette with its back to the light (2003). One can very strongly sense the sun of the South in those paintings, which pitilessly burns the colours and dazzles our eyes. Living in Italy, but still remaining sensitive to the country’s distinctness and folklore, she has not ceased to look for new places being of inspiration to her. Her trip to Greece appeared very fruitful to this end. A few paintings she made there appear to be quite distinctive with their powerful recording capacity. Clearly, these present scenes or situations that Castellini saw with her own eyes, or perhaps even painted them, which would be quite a natural thing for her to do. Some time afterwards, they became a fuel for the paintings. They have been through an artistic filtering process. Details and trifle things have disappeared, and only what is most important has remained: white backgrounds of walls and human figures set, almost carved, against them: and old woman in a chair; another one, at the threshold of her house; women on stairs with a dog; a group of old men in the street. Those paintings are like clicks of a photographic shutter, of one being only interested in the very essence of the scene, and which tends to reject what is superfluous at once. The arrangement of dark silhouettes against a white background, and their shadows, form the entire dramaturgy of the paintings – that is, paintings getting formed under the painter’s eyelids and those actually getting produced. Emptiness, silence, peace and quiet: even if there are some human figures in those paintings, the silence and the peace are not disturbed at all, and it is very good this way. For those are some different measures of time, different human relationships, and different meetings. Things go by their own courses and procedures, and us, random guests in the world where things are set straight and in order, turn up just for a while, to breathe that saltish warm air into our lungs, and then, wander further on to discover other new lands situated far from our homeland. We are perennial pilgrims in a land of artistic revelations, where we can trace and find inspirations, one by one, which contribute to our enriched view of the world. Ms. Castellini’s paintbrush produces monumental and pure works, although their sizes are most frequently not too impressive. The way they look suggests that they might as well be compositions produced in big formats, such a change of scale proving only beneficial to them. However, small dimensions are closer to those of paintings of early Italian painters who have remained her first teachers for ever. The way in which architecture appears in Castellini’s pictures: the rhythms of arcades, facades of houses, stairs, pillars, or pavement tiles of various colours, testifies quite irrefutably to the author’s being excellently versed in the art of early periods. These are quite obvious truths, and not so infrequently to be met, indeed, also in several paintings of the recent years. However, what is new, and indeed so individualistic, about them, is that the painter has introduced a bit of irony through the slightly grotesque look of figures in her paintings. A girl holding a jug on her head, instead of appearing to be a complete(d) southern beauty, has a wide nose glittering in the sunlight as much as it only can. A portrait of an ‘innumerable’ Italian family gathering around their extensive mamma, is also a far cry from any portrait-related objectivity, but in exchange, it gains a power of expression. The artist frequently and willingly paints children, whilst making a little grotesque figures of them, such serious-and-bigheaded ones, as if they were burdened with quite a knowledge of life at the very outset of their lives. Those children do not smile, they are serious, prematurely mature, or even oldish, as if they have been equipped with a tragic wisdom, like the courtly dwarves in Velasquez’s paintings. Also the naked bodies are far from an ideal beauty, those which quite frequently appear in Castellini’s paintings. Those are not some our contemporary versions of Greek or Roman statues; on the contrary, those bodies are even as if too bodily, bloody-bony. They stand firmly on the ground, are heavily seated in their chairs, on stairs or cubes, their breasts heavily falling toward the ground. A grotesque substratum, and quite a powerful one indeed, is something with which several of her paintings are furnished. Culture has produced a figure being ideally dual, expressive, and garish too. This was Harlequin, a character from the commedia dell’arte, whose final, and most interesting, form was given to it in late 18th century by Carlo Goldoni. Added to it were fools, or jesters, wearing their caps with little bells, and pulcinellas wearing high cone-shaped hats, not to mention clowns, as those prove to be the most popular ones. Indeed, quite a team, that, of all those double agents! And when one listens to the painter’s story on her Italian life, almost in an instant a motif appears of Italians recovering from stress with their laugh, a remedy for hard or troublesome situations they come across in their lives. It therefore appears that even if not everyone of them has a Harlequin’s cap with him or her, for many of them, this becomes an almost natural way to escape from the too-pinching daily reality. For Katarzyna Jędrysik-Castellini, a painting symbol of this escape has become the figures of harlequins and fools, so deeply rooted in our culture. The fool’s cap, or, a harlequin’s costume tailored with multicolour rhombus-shaped patches, protect against excessive seriousness of the viewers. It is easier to bear the serious attitude of a jester than one of a philosopher. 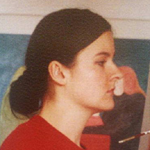 One more extremely characteristic operation to Katarzyna Jędrysik-Castellini’s painting art: often in her paintings, a small, grotesquely astonishing intercalation appears, which entirely changes the significance of the world of her painting compositions, being built with considerable consistency. A small, somewhat bizarre dog; a colour bird with tall legs; a multicolour small ball having as if been lost by a harlequin, and which has by chance stopped by a sculpture making a reference to Rodin’s Thinker – all efficiently operate to dismantle that seriousness. For there are no incidental moments in those paintings: there is a consistently constructed duality of situations and their meanings, and this constitutes one of their major characteristics. Castellini is a master of still life. Usually, such paintings look similar to one another: a few fruits against a neutral background. Lemons, pomergranates, oranges, or an eggplant, stay laid in apparent disorder, slightly projecting their shadows on the canvas’s surface. And, this is virtually it, but at the same time, the intensity of their painting existence, the complex colour and light structure, express a high technical expertise, a skill of watching, and almost a sculptor’s skills. Those fruits and vegetables are delicious, and no-one may be getting a faintest doubt about it. They would serve as a real ornament of any table. In the pictures, however, they become real trompe-l’oeils. No doubt, for Katarzyna Jędrysik-Castellini, the painting tradition is very important. With her eyes fixed on this tradition, she paints her paintings which she practically makes timeless in a very thoughtful manner, as if those scenes could be happening at any time, always, or, for ages now. The Mediterranean climate with which those canvases emanate, as do the scenes having become their subjects, is definitely beneficial to it.